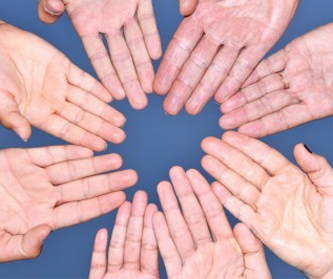 Extraversion predicted: 2d:4d digit ratio, finger length & palm shape! - EXTRAVERSION, 2D:4D digit ratio & hand shape! 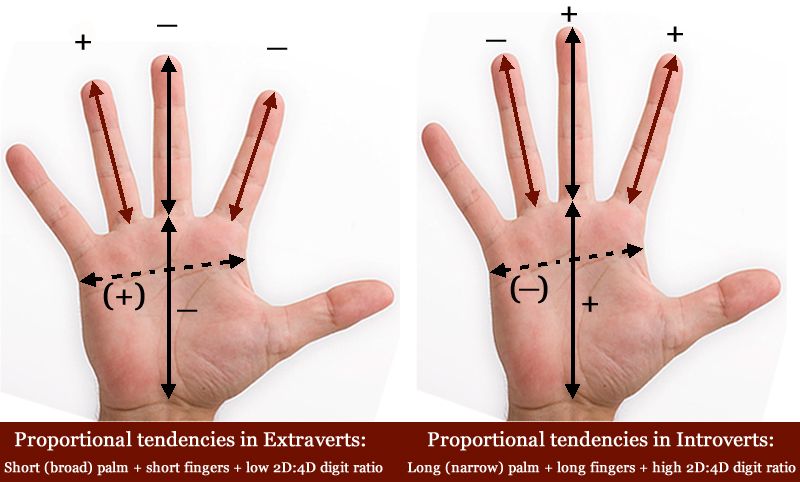 A preceeding report has indicated that the Big Five personality dimension Extraversion correlates with finger length & hand shape (which has been noticed as confirming evidence for earlier scientific findings + guidelines presented by hand reading authors), more findings are presented here pointing out that 2D:4D digit ratio is involved as well. The new results indicate that Extraverts (= high scorers on Extraversion) tend to have a low 2D:4D finger ratio combined with short finger length plus short palm length (relative to palm breadth). And Introverts (= low scorers on Extraversion) tend to have a high 2D:4D finger ratio combined with long finger length plus long palm length relative to palm breadth. A schematic presentation of the new results is presented in the picture below (the '+' and '-' signs display the proportional tendencies in the hands of Extravers and Introverts). Details regarding the underlying results are presented in the picture at the bottom of this article (describing significant results for both the female- and the male sample). The 2D:4D digit ratio results for the Dutch males and females show that Extraverts tend to have lower scores than introverts (see table below); NOTICE: this tendency was noticed for both hands. 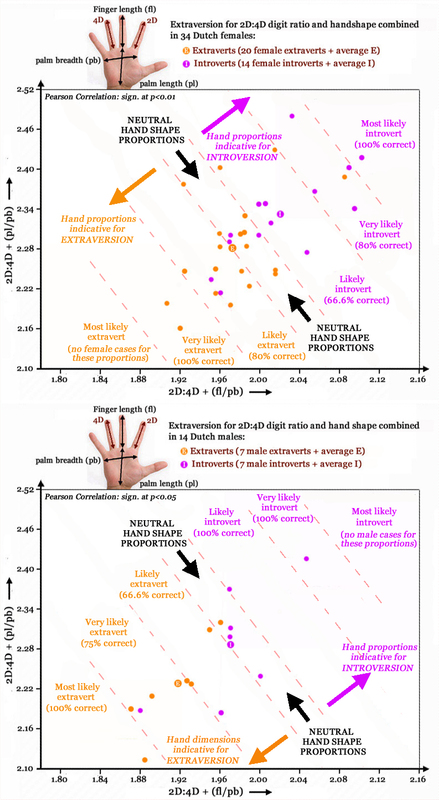 The hand shape ratios the Dutch males and females show that Extraverts tend to have shorter fingers (= lower scores for 'finger length vs. palm length' [FL/PL] and 'finger length vs. palm breadth' [FL/PB]) and shorter palms (= lower scores for 'palm length vs. palm breadth' [PL/PB]) than introverts - who have a more narrow palm (see table below). But this tendency is rather small for the 'finger length vs. palm length' dimension. This explains why at an earlier stage some of the most significant results were spotted for the so-called hand index. NOTICE: these tendencies were noticed for both hands. Combining the results for 2D:4D digit ratio and hand shape shows that Extraverts tend to have significantly lower total scores (and lower scores on all 4 ratios) than introverts (see table below). NOTICE: this tendency was noticed among both sexes for both hands. In order to visualize the effect-size regarding the individual cases a plot is made featured with 'finger length vs. palm breadth' plus 2D:4D digit ratio on the horizontal scale and 'palm length vs. palm breadth' plus 2D:4D digit ratio on the vertical scale: the larger version of the picture on the right is presented at the bottom of this page. The picture not only presents significant results for both the female- and the male sample; the picture also displays statistics which suggest that for 79% of cases OUTSIDE the 'neutral hand shape proportions' can be correctly predicted via the hand shape proportions. And for the 71% of cases INSIDE the 'neutral hand shape proportions' can be predicted via their sexe (70% of those females are 'introverts', and 75% of those males are 'extraverts')! NOTICE: As the effect-size for the ratio 'finger length vs. palm length' is rather small (the effect-size of the other three ratios is always at least 4 times higher) this aspects has been excluded from the plot. The results presented point out that the 2D:4D digit ratio and hand shape combined provide a (very) significant clue regarding the Big Five dimension Extraversion. The results firmly underline the significance of hand signs 1, 3 and 4 in the Hand Model for Extraversion (which was resulted from an analysis of the female population only). How about the other hand signs? The next phase of this study will probably focuss on the role of the length of the pinky finger and/or the proportional development of the four corners of the palm. At a later stage the major palmar lines (and the simian line) will also for sure somewhere get involved. Extraversion versus 2D:4D digit ratio and hand shape in 34 Dutch females & 14 Dutch males. NOTICE: In order to visualize the effect-size of the results the hand shape is presented here as 'finger length versus palm breadth' versus 'palm length versus palm breadth'; additionally 2D:4D digit ratio has been summarized to both dimensions. Dotted oblique lines have been added to illustrate the striking similarities among the sub-groups inside the female- and male sample.